10 Best Self-Inflating Sleeping Pads – What Should You Choose? Comfort, obviously, makes all the difference between a good and a crappy night’s sleep. Since it is highly subjective, we bring you a list of the top 10 best self-inflating sleeping pads that is almost entirely based on customer reviews. There are many reasons to love the FreeLand camping sleeping pad. To start with, it is a very compact self-inflating sleeping pad. Weighing only 3.3 lbs., and measuring 76 by 1.5 by 24.8 inches when fully inflated, it falls on the lighter side of sleeping pads. Surprisingly, in coming up with this lightweight unit, FreeLand did not have to sacrifice comfort. In fact, this is among the self-inflating sleeping pads that have the best blend of comfort and lightweight. Secondly, unseen in many other best self-inflating sleeping pads, the FreeLand sleeping pad has an attached pillow. Quite often, backpackers and hikers have to bring a separate pillow. With this unit, the space that your pillow occupied can be saved for much more important things. When it comes to durability, it is made of the all weather-resistant fabric, 190T polyester pongee. This tough fabric can handle rough and rugged terrains without wear or tear. The FreeLand camping sleeping Pad is simple to inflate and deflate and doesn’t require any prior knowledge. The FreeLand camping sleeping pad is the best self-inflating sleeping pad for its comfort and compact. The self-inflating sleeping pads on the comfort series by Fox Outfitters are designed for serious hikers and campers. Unlike the lightweight series, these best sleeping pads have a width of two inches when fully inflated. So you are assured of total comfort whichever terrain you are sleeping on. Additionally, it is designed using the triple zone comfort padding for added comfort. The feature that seals the deal for me is the non-slip soft touch fabric (experienced campers will know exactly what I am talking about). This makes it almost impossible to slide off of it in the middle of the night. The air valve is made of the very durable non-corrosive brass, and its bottom is made of an abrasion resistant fabric. These features ensure that the pad doesn’t fail you even after years of use. On the downside, the comfort series is not entirely lightweight. It weighs relatively more than similar models so if you don’t mind a little extra weight, you found your sleeping pad. The REDCAMP self-inflating sleeping pad is constructed of an anti-slip 150D PVC coated with Oxford, 190T polyester pongee coating, and filled with an open cell foam filling to minimize air movement. It is available in two different thicknesses (1.2” and 2”) and is actionably larger and wider than most average sleeping pads. The unit comes with an air pillow for added comfort. The diamond chamber foam surface used for the filling, apart from minimizing air movement, is responsible for maintaining heat, and giving better support when sleeping. When you open the valve, it automatically inflates. You will have to wait about 10 minutes before it is completely full and ready to use. The air pillow is blown manually, but since it has a wide enough valve, you won’t have to exert much. The Lightspeed Outdoors XL sleep and camp pad are one of the most recommended and the best self-inflating sleeping pads available. When designing the unit, Lightspeed Outdoors decided to take an entirely different route with this one. Instead of using the conventional PVC materials, they decided not to, and the result was a sleeping pad that has neither the plastic crinkle noises nor the plastic odors. At a thickness of 3 inches, the pad offers both generous size and plush thickness. Side sleepers at times have difficulties finding a sleeping pad that looks after their needs. The Outdoors XL Sleeping Pad does exactly that and more. Additionally, the unit has an insulation rating of R-9.66, sure to keep you warm. When unrolled, the soft foam inside it automatically expands, reducing the need to use a pump or your breath. This self-inflating sleeping pad, as you might’ve already guessed, is not as affordable as some of the options on this list. But if the saying, “you get what you paid for” is true even at the very least, then the price is justified and the model is no longer “expensive” but “valuable”. Coleman has a reputation to maintain, and the 2000016960 self-inflating camping pad does exactly that. Even though nothing in common with a traditional market, the performance, and functionality that it delivers are comparable to nothing else. With a 2.5” width, the Coleman can be said to have more than enough thickness to support whatever sleeping needs you may have. Its tufted build that adds a layer of padding between the ground and your sleeping pad, is surprisingly comfortable and a welcome relief when you arrive home tired. Although all round perfect, weighing 5.4 pounds, this falls on the heavier side of things. As a standalone unit, its weight is not something that would really bother you. But if you want it to fit in your backpack with the rest of the items, you don’t really need the extra weight. 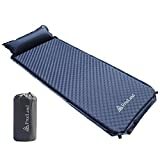 If you are looking for the best sleeping pad that is lightweight, very comfortable, well insulated, and of top-notch quality, you have just found it. 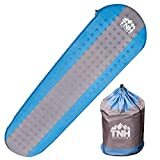 The TNH Outdoors #1 premium sleeping pad is regarded as one of the most comfortable self-inflating sleeping pads on the market. With a 1.5” thickness, you can choose different levels of firmness without worrying that you will feel the ground as you sleep. Thanks to its 75D outer shell, this premium sleeping pad is strong, and you do not have to worry about durability. Operating the unit is very simple, and will only require twisting on the very strong plastic valve. It is more than capable of ensuring you have a good night sleep by keeping you warm all through the night. With an insulation value of 4, the TNH Outdoors #1 Premium Sleeping Pad can insulate you well in a variety of temperatures. 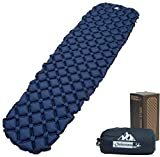 This premium self-inflating sleeping pad, on the downside, falls on the heavier side if you compare it with competing models with the same thickness and R-Value. Casual and entry-level backpackers and campers will love this unit. However, seasoned campers who need to go completely lightweight will go for the other light options in this guide of the best self-inflating sleeping pads. This unit solves two major sleeping pad issues. More often than not, vertically baffled sleeping pads feel sort of bouncy when you readjust of move your feet. Horizontally baffled sleeping pads, on the other hand, often collapse. With a unique v-chamber design and side rails, the Klymit Insulated Static V Sleeping Pad solves these two issues. The self-inflating sleeping pad has a quite sufficient stated R-Value of 4.4, making it quite comfortable to sleep on around snow. Even though it doesn’t meet the R-Value of some sleeping pads that are designed specifically for winter such as therm-a-rest Z SOL, it feels warmer than other pads with similar insulation values. The Insulated Static V Sleeping Pad is not very durable. This, however, can be attributed to the fact that for the purposes of product reviews, the sleeping pads are intentionally abused to test their limits. 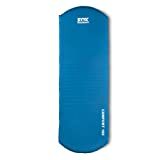 The 30D polyester that is used for this unit, in practice, should be just as durable as some sleeping pads in this review. Should you take care of it well, you will get a pretty decent kick out of it. The ALPS Mountaineering comfort series air pad XXL is the largest and heaviest of the comfort series. It was designed with one goal in mind; to offer the maximum amount of comfort. Measuring 77” by 30” 4” and weighing 8lbs., this XXL self-inflating sleeping pad is not something that you would consider strapping on your backpack alongside your other gear. The ALPS Mountaineering XXL self-inflating sleeping pads are fitted with brass non-corrosive valves for durability. Its bottom is made from abrasion-resistant polyester fabric that has PVC dots to prevent it from sliding around as you sleep. Al the seams on the unit are bonded by heat, ensuring that you get the longest service possible. The pillow area of the unit is thicker than the rest of the pad to ensure maximum comfort. The top, in an effort to maximize comfort, is made of a brushed, suede-like material. Equipped to handle even the coldest months of the year, the XXL has an R-Value of 8.1. With a 4” thickness, the ALPS Mountaineering XXL sleeping pad allows you to dictate the hardness or softness of the surface, as you can allow some air out, and still sleep soundly without feeling the ground. It deflates and inflates fast, only requiring you to open the two valves. The feature that serves as the downside of this unit, could be the reason why some may prefer it. As mentioned above, this unit was created to maximize comfort. As such, they had to sacrifice compactness in order to achieve it. It is very big and heavy, so it might not be for you if you have space constraints or you plan on moving around a lot. 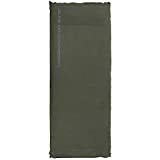 The main selling point of the OutdoorsmanLab ultralight sleeping pad is its compactness and lightweight. 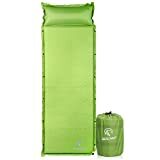 It measures 73” x 21.6” x 2.2” when fully inflated and weighs 15 Oz., making it the preferred choice for backpackers. Although quite affordable, some of the features on this ultralight sleeping pad are only found in self-inflating sleeping pads that you would need to break the bank to acquire. It has an ultra-light 20D nylon construct and coated with TPU. This, among other features such as a non-corrosive brass valve, accounts for its strength and durability. With a 2-inch thickness, the air cell design on this unit makes it very long lasting, capable of use even on uneven grounds. Without a doubt, this is the best sleeping pad for backpackers. On the downside, its R-Value of 1.3-1.5 doesn’t allow you to go camping on extremely cold temperatures. If you are looking for a sleeping pad for use in low temperatures, there are a lot of options in this guide that can sort you out. However, it stands on the 2nd position of this list of the best self-inflating sleeping pads in 2019. Backed by a number of positive reviews by satisfied customers on Amazon, the Klymit Static V Lightweight Sleeping Pad makes it to number one as the best self-inflating sleeping pad in the business. 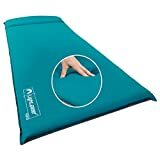 The unique design used in Klymit self-inflating sleeping pads allows for side rails on the Static V. Personally, my biggest fear when sleeping on a sleeping pad is waking up next to it. With the side rails featured on the Static V, I am assured of remaining centered on the pad the whole night. If you toss and turn a lot as you sleep, this sleeping pad meets all your needs. Weighing a mere pound, this sleeping pad is made of ultralight and rugged materials, making it easy to carry and move around. The ultralight abrasion resistant material, 75D polyester, is handy when you want to sleep on the rough ground. It provides puncture, abrasion, and tear resistance. The Klymit Static V Lightweight Sleeping Pad features the ergonomic V-chamber design that limits the movement of air inside the pad. This provides additional comfort and support, allowing you to sleep as you like; on your stomach, back, or side. If you purchase these such compact self-inflating sleeping pads, included in the package is a storage bag and a patch kit in case you need to repair it. It is enough to stand on top of this best self-inflating sleeping pads’ list. These are the top 10 best self-inflating sleeping pads that you would need to spend a night outdoors. They are all self-inflating to alleviate the hassle of set up, comfortable and portable. Each of them has varying features and is made of different materials. This allows you to pick which features you prefer. Take your time and look at each key feature and set yourself up for a very comfortable night.